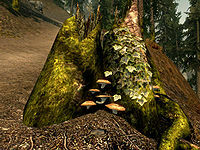 Mora Tapinella is a fungus found growing on tree stumps and fallen trees in forested regions throughout Skyrim. It is however not so common in the Rift where the scaly pholiota is the main tree fungus. This page was last modified on 9 April 2018, at 05:25.